Willett wants to experience the same support which roared Rory McIlroy to a home victory last week after making a flawless start to the BMW PGA Championship. In his first round in England since winning his maiden major title at Augusta, Willett carded six birdies and no bogeys in an opening 66 at Wentworth to finish a shot behind YE Yang, Joost Luiten and Scott Hend. 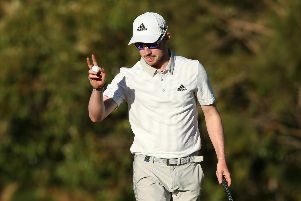 The 28-year-old from Sheffield experienced at first hand the backing McIlroy received in the Dubai Duty Free Irish Open, playing alongside the four-time major winner in the final round. Although he slipped to a tie for 23rd after a closing 77, Willett would like the English crowds to replicate the atmosphere which helped McIlroy claim his first win of the year at The K Club. “The reception on the first tee was amazing,” said Willett, whose best finish at Wentworth saw him fifth on his debut in 2010, when he led after an opening 65. Hend carded eight birdies and a solitary bogey on the 15th as a more conservative approach paid off for the big-hitting 43-year-old. “I tried aggressive last year and it really doesn’t work,” said the world number 85, who missed the cut on his debut last year. Yang, who made history in the 2009 US PGA as the first player to come from behind to beat Tiger Woods in the final round of a major, also carded eight birdies and one bogey, while Luiten bogeyed the first and 16th but fired nine birdies to bounce back in style from rounds of 75 and 80 in Ireland. Australia’s Richard Green, England’s Robert Rock and South Africa’s Jaco van Zyl were two shots off the pace, and Luke Donald impressed with an opening 68. David Drysdale and Craig Lee led the Scottish challenge with two-under-par rounds of 70 and are tied for 21st place. Behind them were Richie Ramsay and Greig Hutcheon (both 71) and Scott Jamieson, Paul Lawrie and Graham Fox (all 72). Russell Knox had a disappointing day with three bogeys and a double bogey in a round of 75, a score matched by Stephen Gallacher. Defending champion Byeong Hun An had held the early lead when he carded four birdies in succession from the fourth, only to bogey the ninth and cover the back nine in 40 to card a level-par 72.